* All dates are weather-dependent. Natural Science and Engineering Research Laboratory (NSERL) Dec 21 2011 5:00 p.m. – 7:00 p.m.
Dec 26 2011 8:00 a.m. – 5:00 p.m.
Dec 26 2011 8:00 a.m. – 9:00 a.m.
Waterview Science and Technology Center (WSTC) Dec 27 2011 8:00 a.m. – 5:00 p.m.
Engineering & Computer Science North (ECSN) Dec 28 2011 7:00 a.m. – 4:00 p.m.
Alexander Clark Center (formerly the Conference Center) Dec 29 2011 8:00 a.m. – 5:00 p.m.
Before you leave for winter break, we recommend that you turn off your computers, copiers and other electronic equipment and unplug them if possible. Visit us on Facebook for more winter break energy-saving tips. 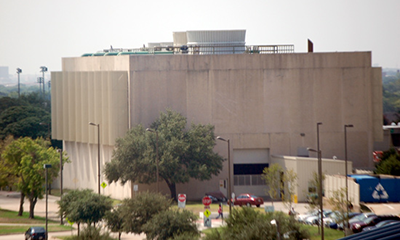 The Central Energy Plant on Rutford Avenue will get some routine maintenance over the winter break leaving a number of campus buildings without heat from 5: p.m. Wednesday, December 21 through Wednesday, December 28. All other campus buildings will be without heat for the week ending December 28. In case of severe weather, the contractor will work with Facilities Management to ensure all buildings are kept between 40 and 80 degrees Fahrenheit. If sub-freezing temperatures are forecast to persist, the shutdown may be postponed or canceled. For more information, contact Steve Lyles, Facilities Management utilities superintendent, at 972.883.2147. This Google Earth image shows that parking Lot Q near the Jindal School of Management will be closed Saturday, November 19 and Sunday, November 20, for restriping and sealing. The lot will reopen Monday morning, November 21. 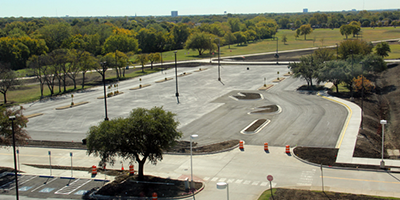 Lot Q, just east of the Naveen Jindal School of Management (JSOM), will be closed this weekend, November 19-20, in order for crews to seal coat and re-stripe the lot. No other streets or parking lots will be affected. Lot M East, formerly parking Lot M, has been rehabilitated to offer northern and sourthern entrances and exits. A section was regraded for better drainage, and sidewalks have been added. Lot M East near the Naveen Jindal School of Management (JSOM) will reopen Monday, November 7, after weeks of repair and reconstruction. The lot was closed September 26 so crews could reconfigure parking spaces and improve a road connecting Lot M East with Lot M West and Lot Q. Crews have begun roof work on Founders and Founders North, a project expected to run up to two months, weather permitting. A work staging area is located north of Founders North and south of the Jonsson Academic Center, home to the School of Arts and Humanities. Pedestrian pathways will be altered. Exercise caution when traveling near work areas. For more information, contact Tony Franklin, maintenance coordinator, at 972.883.6518. A power outage is scheduled for Saturday, October 15 at the Jonsson School of Engineering and Computer Science. 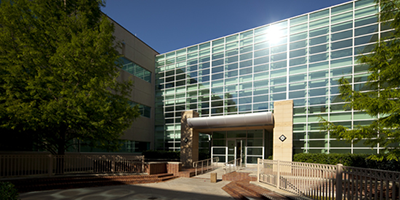 Crews will shut down power to the Erik Jonsson School of Engineering and Computer Science Building on Saturday, October 15, to support a number of building projects. The outage will occur from 6:00 a.m. until 8:00 p.m. For safety, no one will be allowed in the building without UT Dallas Police authorization during the outage period. The pedestrian bridges leading into ECS from Berkner Hall and from ECS South will be closed to traffic during the outage. For more information, contact Kelly Kinnard, Director for Physical Plant Services, at 972.883.2549. A pilot progam launches Monday, October 10, that adds a fourth bus to DART Route 883, shown in this Google Maps illustration. 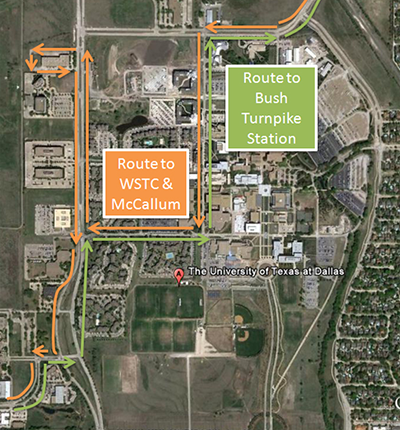 Buses to McCallum and WSTC will run southbound on Rutford. Buses running northbound on Rutford will all go to Bush Turnpike Station. 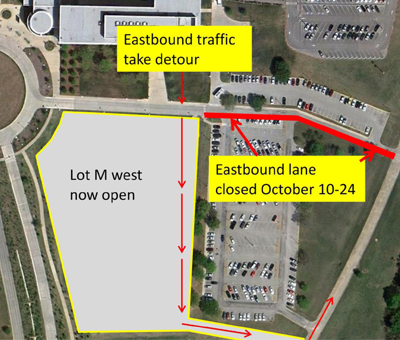 Eastbound East Drive traffic near the School of Management will be diverted through parking Lot M West starting Monday, October 10, to accommodate crews working on a road construction project. Weather permitting, the detour is scheduled to come down October 24. Eastbound traffic on East Drive will be detoured around road construction near parking Lot M starting Monday, October 10 until Monday, October 24. Access to newly opened parking Lot M West will not be affected. To help minimize traffic through the construction zone, drivers entering UT Dallas from Campbell Road are asked to use Armstrong Drive rather than University Parkway to avoid the traffic circle and access parking Lot Q and Lots A through D. Watch for barricades and detour signs on East Drive and exercise caution when driving near the School of Management during the construction period. Questions concerning this project may be directed to Nick Argueta, project manager for Facilities Management, at 972.883.6834. 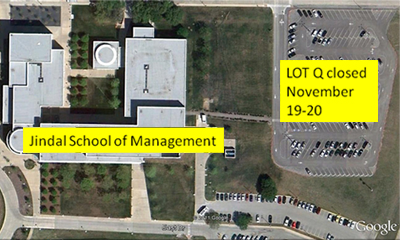 From left: Lot M East will close Monday, September 26 just as the new lot outside the School of Management opens. Weather permitting, Lot M East should reopen around Monday, October 17. 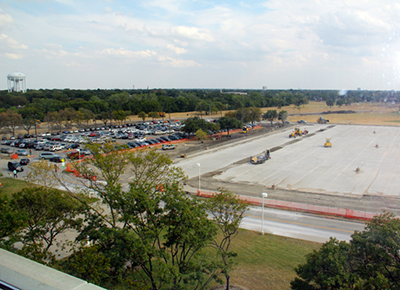 A newly constructed parking lot south of the School of Management (SOM) is scheduled to open Monday, September 26. Simultaneously, Lot M East, southeast of SOM, will close for three weeks so crews can make needed repairs and reconfigure parking spaces. Questions concerning this project may be directed to Nick Argueta, project manager for Facilities Management, at 972.883.6834. Portions of the passage between Engineering & Computer Science North and the Dining Hall are being used as a staging area for crews working to convert 3rd floor space in Founders into new laboratories. Construction will begin Monday, September 19, on the conversion of the eastern portion of the Founders building’s 3rd floor to laboratory space. The contractor staging area will be located on the north side of the Dining Hall and east of the Engineering & Computer Science North building as shown in the photo. Pedestrians traveling in the vicinity of the contractor staging area are requested to exercise caution at all times. Construction is expected to be completed in May 2012. Questions concerning this project may be directed to Bill Elvey, director of engineering, construction and planning, Facilities Management, at 972.883.2124. The mall-level northeast entrance (far left) to the Student Union will close, starting Monday, September 19, for improvements expected to take work crews several months to complete. Beginning Monday, September 19, the northeast entrance to the Student Union will be closed so crews can make improvements to the building vestibule and entrance area. This entrance will remain closed for several months while work progresses; access the Student Union’s lower level directly by using the doors located farther south along the mall. Those traveling near the construction area should exercise caution and observe safety barricades and signage. For questions, contact Facilities Management Project Manager Supat Rachavong at 972.883.2123. As part of an ongoing utility infrastructure improvement project, crews will cut steam service to most of campus Friday night, April 15, and Saturday morning, April 16. For more information, please contact Kelly Kinnard, director for Physical Plant Services, at 972.883.2549. 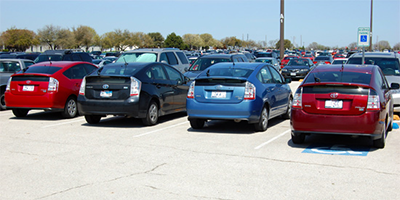 With an extra 1,000 guests coming onto campus for events scheduled Thursday and Friday, March 24 and 25, students, faculty and staff accustomed to parking in Lots Q and M will have to find spaces elsewhere. Two events this week — the 6th Annual Fraud Conference and the National Debate Tournament — are expected to draw as many as 1,000 additional guests to campus. On Thursday, March 24 and Friday, March 25, Lots Q and M (Orange, Gold, & Green) near the School of Management will be reserved. If you normally park in these lots, be advised to arrive a few minutes early to find alternative parking. Lots A, B, C and D are nearby and have adequate parking. Lots A, B, C and D can be accessed off Armstrong by turning right onto Drive A, which was reopened March 17, or by taking Floyd Road north (or south from Synergy Park Boulevard) to Lookout Drive and heading west. The first left and right turns off Lookout lead to the parking lots. In addition, Lot I will be reserved to accommodate debate tournament participants. For more information, please contact Paul Smith in Parking and Transportation (972.883.2344 / park@utdallas.edu). A tree-relocation project set for Tuesday and Wednesday, March 22-23, may slow traffic along Rutford Avenue near the Science Learning Center and Central Energy Plant and along walkways near McDermott Library, the Bookstore and tennis courts. If possible, try to avoid the areas or allow extra time to travel through them as there will be delays. For more information, please contact Landscape Supervisor Jay Jascott at 214.205.1598. This Google Earth image features parking Lots C and D, which normally can be accessed off Drive A near Armstrong. Starting Thursday, March 10, the section of Drive A shown in red will be off-limits to both vehicular and pedestrian traffic. And a week later, March 17, Drive G will close, too. Crews working to construct the Satellite Utility Plant will shut down portions of Drives A and G over the next two weeks. 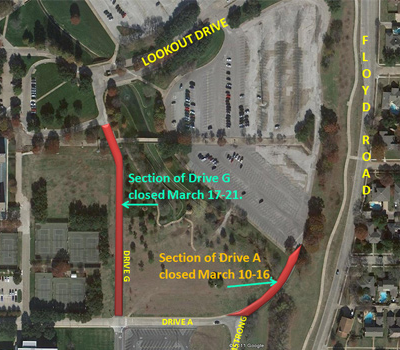 Drive A will close Thursday, March 10 till Wednesday, March 16 from its intersection with Armstrong Drive north to Lot D. The project also will take out the sidewalk along Drive A. The following Thursday, March 17 to Monday, March 21, a section of Drive G will close between Drive A north to Lookout Drive. 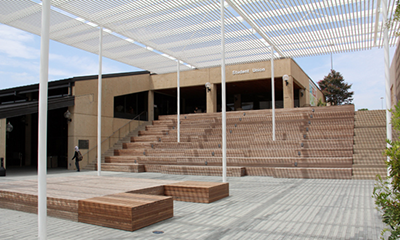 To reach McDermott Library and the Green Center, enter the UT Dallas campus off Floyd Road using Lookout Drive. For more information, please contact Kelly Kinnard, director for Physical Plant Services, at 972.883.2549. Crews remove years of dirt, mold and debris from Founders, the oldest building on campus, Thursday, March 3. 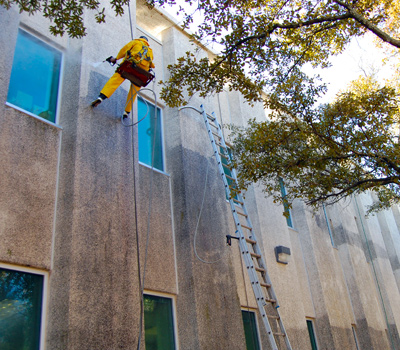 High-pressure power washing of the exteriors of 10 campus buildings begins Thursday, February 24, and is scheduled for completion in April, weather permitting. As a result, pedestrian traffic at times may be temporarily re-routed near entrance and exit doors. Exercise caution as ladders, ropes and workers hanging from overhead may occasionally obstruct pathways. Please direct any questions or concerns to Building Services Supervisor Bron Clayton. He can be reached at 469.387.2561. In this Google Earth image, the footprint of the upcoming satellite utility plant is outlined in red. ONCOR is scheduled to trench and bore underground power lines along Floyd Road this month. 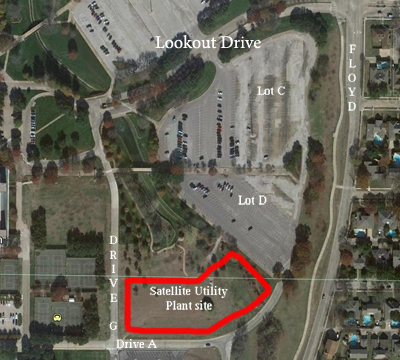 ONCOR is scheduled to begin installing underground power lines Tuesday, January 25, to feed the upcoming Satellite Utility Plant, which will begin construction this semester. The work will take place along Floyd Road, just south of the north entrance to parking Lot A. Crews will trench and bore an underground “tunnel” heading south on Floyd beneath Lookout Drive and past Lot C, where the trenching and boring will turn west toward the intersection of Armstrong Parkway and Drive A, site of the plant. Please use caution when driving across Lookout Drive, Drive A or when using the sidewalks parallel to Floyd Road and be mindful of construction crews in the vicinity. In this Google Earth image, the yellow lines show the footprint of the Visitors Center and Campus Store construction site and set-up areas in Lot J. The fencing in Lot J will force drivers along the route pictured in red. Construction of the new Visitors Center and Campus Store, which breaks ground this month, will require modifications to parking Lot J to accommodate the project construction site and contractor staging areas. 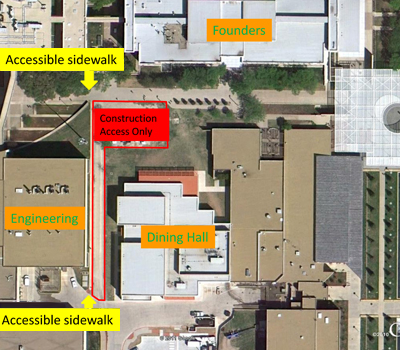 In the map below, please note the fencing for the Visitors Center and Campus Store site in yellow. As a result, nine of 12 disabled parking spaces will be lost near the Activity Center. 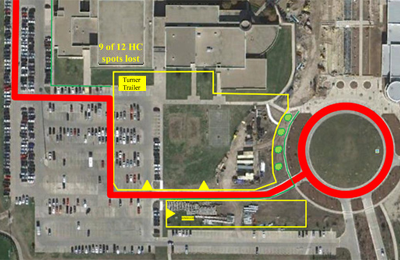 In addition, the path in red shows drivers how to get through Lot J from the Roundabout to Drive A. The Visitors Center and Campus Store is slated for completion this summer. If there are any questions concerning these changes, please contact Paul Smith with Parking Services at 972.883.2438.